The team is all waiting for you at the Truck Stop, so time to haul that truck all the way to the station to earn yourself some hefty winnings. Click here to play! There isn't much time so hop to it and enjoy the cash! 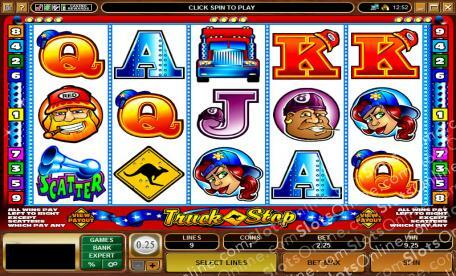 Truck Stop is a fun 5-reel slot played across 9 lines of big engine mayhem, where the more lines activated will increase your payout on winning combinations. The Beer is Wild and can be substituted for any other symbol except Scatters, while Big Red will keep you trucking with up to 1000 times your initial wager in payouts. The Horn is Scattered and can appear anywhere on the reels. It will also multiply your wins depending on the number of credits staked. Keep your eyes on the road and your foot to the floor, because the Truck Stop isn't far away! Plenty of massive cash jackpots are waiting for you! The Horn is Scattered and can pay out up to 100 time your initial bet, as well as multiplying the Scattered wins by the number of credits staked. The Beer is Wild and can be substituted for any other symbol on the reels except Scattered Beer.